If you have multiple blogs, bookmarking accounts and other social media accounts then you’ll want to be able to post to them easily, without having to log into them all and paste the same message over and over again. The good news is that some clever people thought of this a while ago and have given us some online tools to be able to push updates out in a click of a button. It would be very beneficial at this point to set up the following accounts for starters. I recommend using the list below as they all seem to perform well. A Typepad account. Click here. Also create an RSS feed. Click here for step by step guide on how to do this by hand. Don’t forget to make a list of all the login details as it’s very easy to let all these login credentials run away with themselves! Click here to download a spreadsheet for you to log these details in. OK, here we go. The idea below is one method of disseminating information on the web. You may choose to use this method, ignore it or adapt it slightly. Either way the results are the same. Make sure you have at least 1 entry in your RSS feed. Click on the publicize tab at the top. Click on the Socialize option in the left hand menu. Click the “Add a Twitter account button” and enter your Twitter account details where necessary. Change the “Post Content” dropdown options to Title and body. In the “Additional text” box type in # and then a tag that best describes your business. E.g. #SEO. This allows people to search in Twitter for hash tags and relevant tweets. Click on the Activate button at the bottom. Now every time you update your RSS feed, Feedburner will pass your update to Twitter as a tweet. Simples! Sign up for a Ping.fm account here. Get the login details for your blogs to hand and then click on Add Network for Blogger and then Tumblr. When presented with the “Use for” options, select Blogging. When you want to post something from the dashboard select the PING MY options then choose BLOGS. Type your message and headline in the boxes below and then click on the PING IT button. Your message, update and link are now on the blogs that you added. I am using Ping.fm for posting to these 2 blogs, you can add many more blogs here or even status update sites for that matter. The choice is yours but don’t post the same message to more than 6 sites though over different social mediums, mix it up a little. Did you know that you can also tie in your RSS feed to Ping.fm? 1 RSS feed could now post to 3 different accounts. It’s for you to decide on a posting system from here on, but read on before you decide. Add your 2 bookmarking sites to the services page. You can install the bookmarking button on your site if you wish. Your post will now been sent out to all your bookmarking sites that have been added to Onlywire. If you find it easier, you can just use Ping.fm, although Ping.fm does not support all the bookmarking sites. There are a few tools out there that allow you to schedule a post for a certain time and date in the future. The best one that II have come across is Hootsuite, so this is the one that I will guide you through. Go to http://hootsuite.com and sign up for a free account. When you have signed up, you will be presented with an Add Social Network screen. Add your Twitter, Facebook and Ping.fm accounts here. So, now let’s have a look at the diagram below and see what we have setup. 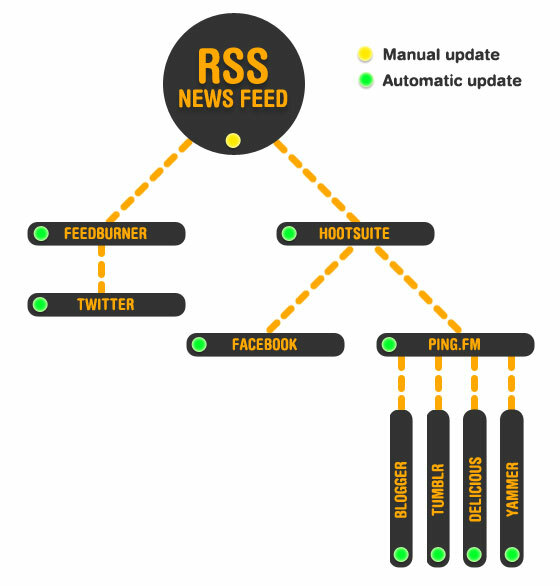 This diagram would be best to implement and would only require you to update your RSS feed, the rest is automatic! Remember this can be as big and as complicated as you want it to be, I’ve kept it simple for this example. In the diagram below I have removed Onlywire, added Delicious to Ping FM and chose another site to replace Digg. That way, everything is driven from 1 RSS feed. You like? Remember, you can still use Hootsuite to send out manual or scheduled updates to all the social media sites shown in the diagram above. You can update your RSS feed by hand and change the date, RSS id number, title, link, image and description. Or you can buy some software to do it for you. If you’re looking for some software then there are a few options below. Did you know that if your RSS feed gets bigger than around 300k then feedburner will have a bit of a fit with it. If your RSS feed gets any bigger than that then just delete the last 50% of it. If you have a blog that you’ve updated and you want to get the content indexed as quickly as possible, and announced to many web services, then follow the steps below. Enter your blog name and home page in the relevant boxes. Update your RSS feed on your site and then place a link to this feed In the RSS box. Tick the services in the section below that are relevant to you. Click the Send Pings button. All done, your new content has been announced! I recently came across this site, really useful with a multitude of SEO tools to use. Just a quick word to say that there are many more social media apps out there that can make your life easier. I have listed 2 more below. If you manage to implement these or anymore into your content dissemination program, then let me know how yours work.